↑ अ आ इ ई उ Van Leeuwen, F. (2007). "Validation of the new Hipparcos reduction". Astronomy and Astrophysics. 474 (2): 653. arXiv:0708.1752. डीओआइ:10.1051/0004-6361:20078357. बिबकोड:2007A&A...474..653V. ↑ अ आ Grady, C. A.; Bjorkman, K. S.; Snow, T. P.; Sonneborn, George; Shore, Steven N.; Barker, Paul K. (April 1989). "Highly ionized stellar winds in Be stars. II - Winds in B6-B9.5e stars". Astrophysical Journal, Part 1. 339: 403–419. डीओआइ:10.1086/167306. बिबकोड:1989ApJ...339..403G. ↑ अ आ Johnson, H. L.; Iriarte, B.; Mitchell, R. I.; Wisniewskj, W. Z. (1966). "UBVRIJKL photometry of the bright stars". Communications of the Lunar and Planetary Laboratory. 4: 99–110. बिबकोड:1966CoLPL...4...99J. ↑ Pearce, J. A.; Hill, G. (1975). 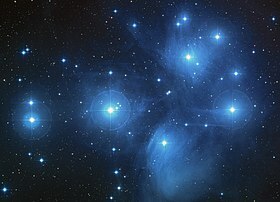 "A spectroscopic investigation of the Pleiades". Publications of the Dominion Astrophysical Observatory. 14 (14): 319–343. बिबकोड:1975PDAO...14..319P. ↑ Zhang, P; Liu, C. Q; Chen, P. S (2006). "Absolute Magnitudes of Be Stars Based on Hipparcos Parallaxes". Astrophysics and Space Science. 306 (3): 113. डीओआइ:10.1007/s10509-006-9173-1. बिबकोड:2006Ap&SS.306..113Z. ↑ अ आ Harmanec, P (2000). "Physical Properties and Evolutionary Stage of Be Stars". The Be Phenomenon in Early-Type Stars. 214: 13. बिबकोड:2000ASPC..214...13H. ↑ अ आ इ Frémat, Y.; Zorec, J.; Hubert, A.-M.; Floquet, M. (September 2005). "Effects of gravitational darkening on the determination of fundamental parameters in fast-rotating B-type stars". Astronomy and Astrophysics. 440 (1): 305–320. arXiv:astro-ph/0503381. डीओआइ:10.1051/0004-6361:20042229. बिबकोड:2005A&A...440..305F.